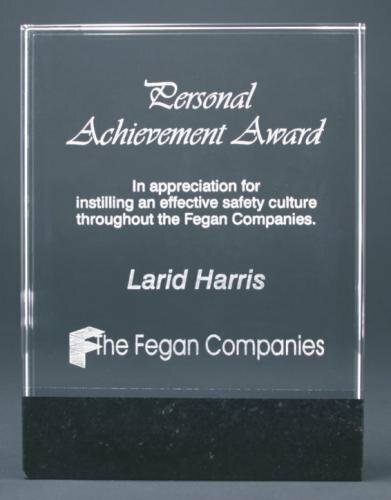 Fusion glass with a genuine black marble base, each of these glass awards is 1" thick and laser engraved to a frost white directly into the glass. Available in four different sizes, these glass awards make an excellent presentation. 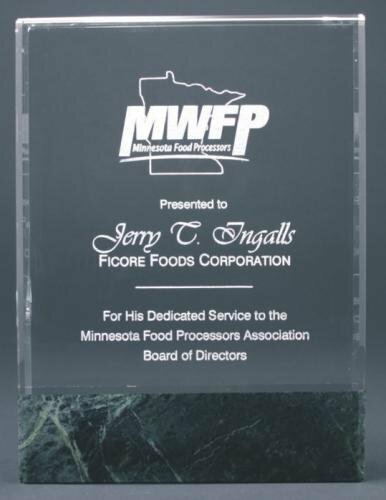 Fusion glass with a genuine green marble base, each of these glass awards is 1" thick and laser engraved to a frost white directly into the glass. Available in four different sizes, these glass awards make an excellent presentation. This 3/8” thick clear polished acrylic plaque comes with a white self -adhesive hanging attachment that placed on the back of the plaque really makes your personalization stand out. The rich purple marble engraving area is framed by a sleek black border for an elegant, modern recognition of excellence.